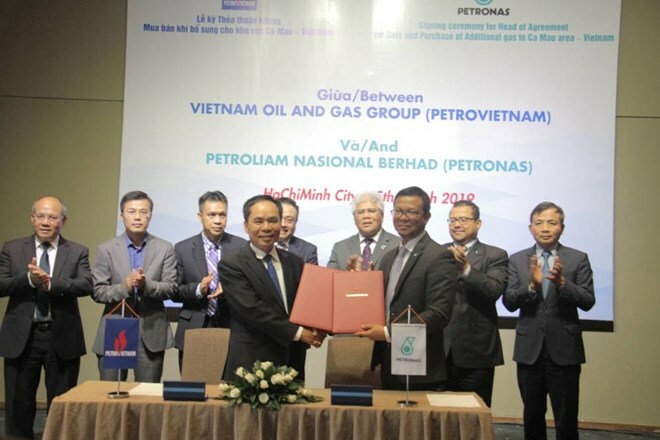 Hanoi (VNA) – The Vietnam Oil and Gas Group (PetroVietnam) and Malaysia’s Petroliam Nasional Berhad (Petronas) have signed a Head of Agreement (HOA) for the sale and purchase of additional gas to Ca Mau area. The deal, signed in Ho Chi Minh City on March 15, demonstrated the fruitful partnership between the two State-own oil and gas corporations, and provided an important prerequisite for the two sides to reach a full agreement on the purchase of gas to serve the operation of the Ca Mau gas-power-fertiliser complex. It comprises three projects covering more than 200ha in the Khanh An commune of U Minh district, the southernmost province of Ca Mau. A report at the meeting, which reviewed the coordination in operating the complex, said that the PM3-Ca Mau pipeline, put into use by PV Gas in 2007, has supplied about 2 billion cubic metres of gas each year. The two gas power plants have generated over 7 percent of the electricity output nationwide. Meanwhile, 40 percent of total urea output in Vietnam is produced by the fertiliser factory of the complex.